Bundle Three Selections and Save $300! If you are refreshing the exterior of your house, most often you will need to coordinate three main elements: siding, trim and a front door colour. Maria has created a special bundle package that lets you save $100 on the cost of each of these selections. That’s a savings of $300! The best colour for the body of your house, whether it’s stucco, fiber-cement (Hardie board) or vinyl siding, will be determined by all the other fixed elements on your home. Get Maria’s expertise on the perfect colours to coordinate with our best value Bundle It! consultation. It’s rare that you can pick your favorite colour, or just any colour for the exterior of your house. Typically, there are fixed elements to consider such as stone or brick, the window colour, and/or a roof colour that is not changing. Even the colours of your neighbors’ houses need to be considered. Even if you don’t have any bossy elements to coordinate with, and your neighbors are acres away, it’s still important to consider the architecture and style of your house to arrive at the most pleasing and timeless colour palette. Maria has over 20 years of experience specifying colour for exteriors. Her proprietary System for Specifying Colour and Understanding Undertones makes her expertise uniquely effective. She can quickly identify the neutral undertones in your fixed elements and thoughtfully generate colour palette options that will work seamlessly with them. Her advice is always tailored to creating a classic and timeless look for many years to come. No one wants to have to repaint their exterior in 5 years because the colours, once trendy, look badly out of date. This bundle offers you Maria’s advice for coordinating the key elements of your exterior: the main body colour, trim colour and a bonus front door colour to create a perfect, welcoming focal point. Do you have a brick house? Are you wondering whether you should paint the brick? And what your options are if you don’t? Maria can offer you options for all scenarios. Please note: Sometimes, to accomplish the freshest look, she may save you time and money and advise you to keep the existing window or trim colour for example. Sometimes the correct and most beautiful solution is to simply paint the trim and body the same colour. However, please note, the cost of the consultation covers her consideration and analysis of the best solution for the three elements covered (body, trim and front door), regardless of the number of colours specified. Maria is happy to include advice on details like the right style of door for your house, or feedback on the style and idea of any structural upgrades you are considering. However, this is colour and style advice only and it in no way replaces the need to engage an architect for structural changes. Please also note: If you need help choosing additional specialty claddings for your exterior such as brick and/or stone, a new roof colour, or any other elements not included in the Bundle, consider the Total All Inclusive Exterior Colour Consultation here. The photos we provide are of a home exterior painted in the recommended colour to help you visualize how a colour or material selection will look. We do not provide renderings because they don’t generally give an accurate idea of what the colour will really look like since exterior colour gets 3-4 times brighter once it’s applied. It’s much more important to get the neutral undertones right and to test your colours correctly. Maria’s eDesign service provides 20 years of specifying colour for thousands of homes and getting the colour right, and most importantly getting the neutral undertone correct. 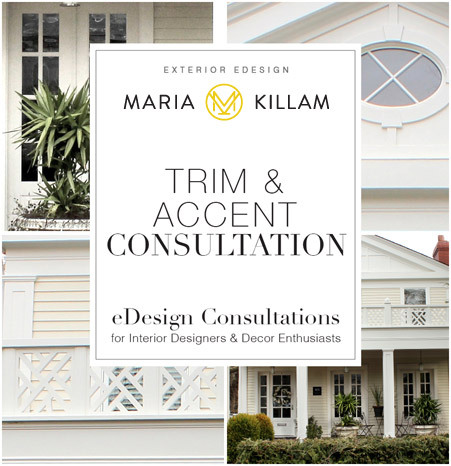 Once you purchase this Exterior Colour Consultation you’ll receive a prompt email with a download for a detailed questionnaire so you can describe your question and provide the relevant information Maria needs. The questionnaire includes instructions for submitting your information as well as how to take and share your photos.. Note: This Exterior Colour Consultation is a residential service. Please contact us for a quote for commercial property inquiries. You will receive Maria’s recommendations in your inbox within 5 – 7 business days from when we receive your complete information.